Have you heard that the 888 Ladies £5m bingo game has been won and surprise surprise the jackpot won by 888 Ladies winner ‘gemdanben’ was in fact £50,000 and sadly not anywhere near the £5m that was seen in the TV adverts. 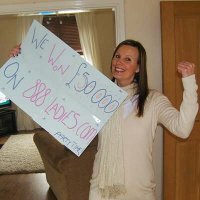 However the very sizeable £50k win by gemdanben was the biggest ever single jackpot win for any 888 Ladies bingo player, and judging by the picture on the 888 Ladies Bingo site the lucky bingo winner seems awfully pleased with herself. 888 Ladies Bingo winner is actually expanding her family (and her waistline at the moment!) and so the extra cash provided by the 888 Ladies Bingo win, will certainly come in handy. The new little person is not expected to arrive until July so gemdanben, her partner and their young son are hoping that they will have time for a little holiday to Egypt or the Canaries before the big day. The young family also hope to buy a new car and move house so certainly a busy few months for the bingo playing yummy mummy. £50k jackpot winner never wins anything …. Are you sure? Gemdanben is a new player at the 888 Ladies bingo site and was told all about the joys of playing at the online bingo site by her sisters who are both regular players. It is certainly worth spreading the word about 888 Ladies, and who knows one of your friends, family or even you may end up as lucky as gemdanben did. The lucky bingo winner is overjoyed by the big win, but was quite adamant when contacted by 888 Ladies that she ‘never won anything!’ – clearly saving all the little wins up for one big fat one then gemdanben! In fact when 888 Ladies called to break the news to gemdanben her partner thought they were trying to sell timeshare to them and so he said that she was in bed!